I think last week’s challenge is one of my favorites so far. The design constraints of working with clip art brought out truly innovative ideas. It reminds me, once again, of the amazing creativity in this community. This week we’re tightening the design constraints even more. Everyone will work from the same clip art style to design a corporate-friendly template. Using clip art Style 1368, design a course template for a corporate ethics e-learning course. Include at least three content slides and two quizzing slides. Your slides can be static or built out as working interactions. We just want to see how your template carries across your project. To help keep you focused on the template design, you can pull content from this Ethics Training for Special Government Employees course. You can use PowerPoint, Word, Articulate Storyline, Articulate Studio ’09, or Articulate Studio ’13, to design your ethics template. 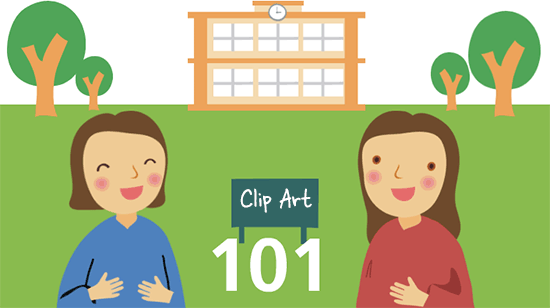 Refer to last week’s clip art challenge for articles about using clip art in e-learning. If you haven’t looked over the previous demos shared by your fellow community members, please make the time to do so! What I like most about these challenges is that I see new ideas in even the most basic examples. Tricia Ransom offered a healthy serving of creativity in her Farm Fresh Vegetable template. Destery Hildenbrand proved that clip art doesn’t have to be scary in his Halloween-themed demo. Jackie Van Nice found a way to relieve the pain from clip art by putting them to good use in this sales demo. Be sure to read her post where she describes how she put the demo together. Heather Steckley reminds us that breaking clip art is better than breaking office romance policies. Mark Woolwine went back to school to educate us on college basics in this creative demo. Be sure to check out Mark’s blog post on how he created his project. Rachel Ingram shared a wonderful demo that will get you up out of your seat. David Lindenberg shared another great demo and revealed his design process in a related blog post. Veronica Budnikas negotiated a winning concept with this creative demo. The file cabinet menu rocks! Love these demos. I'll feature more of them on the Rapid E-Learning Blog. If you write a blog post about your template or do a screenr that's even better. :) I'll be sure to give you plenty of props. I've accepted this week's challenge and have my e-learning piece all ready to go....but I could use some help with publishing it to post here! I published my Storyline file to the web and have a zip file....but I'm lost from there (I'm a publishing newbie). Any suggestions on how to use Google Drive to publish would be greatly appreciated! I'd love to share my work with this week's challenge!!! Lara I think this link will be helpful: http://chronicle.com/blogs/profhacker/host-a-website-on-google-drive/46737 When you create public folder on Google Drive you have to put all files (unziped files) to this folder. After that mark story.html file and click on More button. Form list select Detiles. On the right on your screen you will see Hosting. Copy this link and past here. I hope this is helpful. Hey Lara - Thanks for taking up this week's challenge! Check out Mike Taylor's recent post on sharing published Articulate projects in Google Drive: https://community.articulate.com/articles/how-to-share-your-e-learning-course-for-free-with-google-drive I'm happy to post your published project to our servers if that's easier for you. Just send me a DM if you're interested. okay well, now I'm really embarrassed. Google drive changed a bunch of things! I don't know how to pull these comments down. Hey Dawn! Thanks so much for participating this week. The balloon navigation totally works. I really like that. I also like the customization of the book on slide 4. Books make great objects to personalize. Add a company logo to the book and you just branded the Code of Conduct manual:-) It looks like you added both a 4x3 and widescreen presentation. Do you want me to remove one of your comments so both presentations aren't linked? Send me a DM and I'll be more than happy to remove either the comment or link for you. Thanks again for sharing! Great demo, Paul! I like the fading transition from the table buttons to each topic. Looking forward to connecting with you next week in Utrecht. Hi everyone! Just a quick post to let you know the clipart recap is current: https://community.articulate.com/articles/using-clipart-to-design-ethics-training If you shared an example and it's not in the recap, let me know immediately so I can add it. Thanks! Here is my entry to this challenge: http://www.elearningbydana.com/ELearningChallenges/ELH9Ethics_CanIUseThisImage/story_html5.html But, instead of using the clipart because I am late to the game :), I decided to trace clipart that I found on 123RF to practice my Illustrator skills. I tried creating some of the characters on my own, but they looked completely weird...so that is the next skill that I want to tackle...drawing.